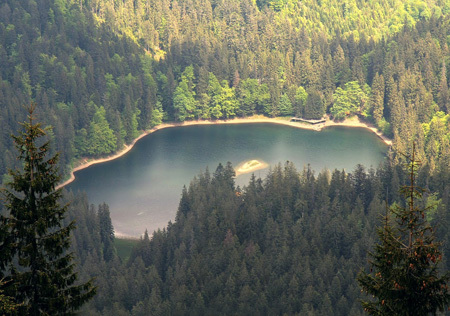 The largest lake in the Ukrainian Carpathians and one of the Seven Wonders of Ukraine. Nestled between the mountains, around spruce-fir forest at an altitude of 989 meters above sea level on the southern slopes of Gorgany in the basin formed by mountains Ozerna (1495 meters), Slenizor (1235 meters) and spur Dividing Range. 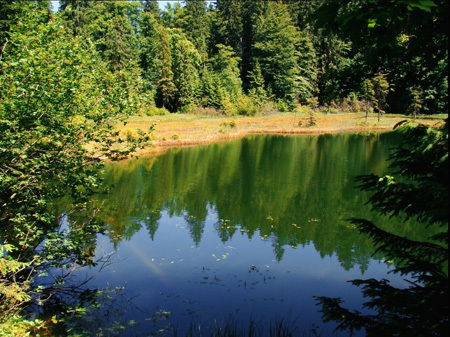 Lake area is 7 ha, average depth - 16-17 m, maximum - 24 m. The lake is fed by surface and atmospheric waters. The lake water is clean, clear, slightly mineralized, fauna is represented by certain types of shellfish. Near the lake is a viewing platform from which you can enjoy all the beauty of mountain water. Wild lake is located on the hillside Hropa. Sphagnum oligotrophic bogs Gluhania and Zamshatka where is growing number of rare species, are always the subject of increased attention of scientists. 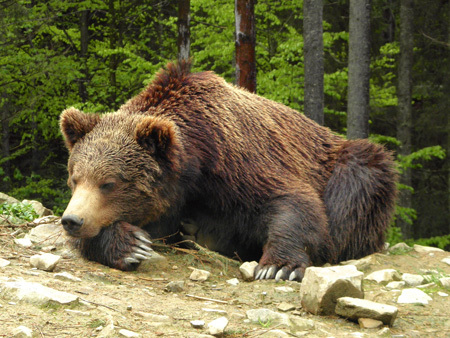 At the Center the rehabilitation of animals of this species is carried out, which, while in captivity, suffered abuse. The Centre acquaints visitors in details with unique nature and cultural heritage of the region. A special exhibition of this institution has exhibits from a single timber floating museum in Europe. 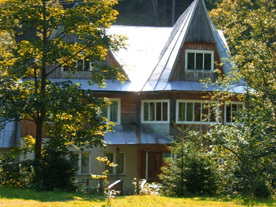 The Museum of architecture and life of Transcarpathians is located in the open air, on the river Kolochavka. 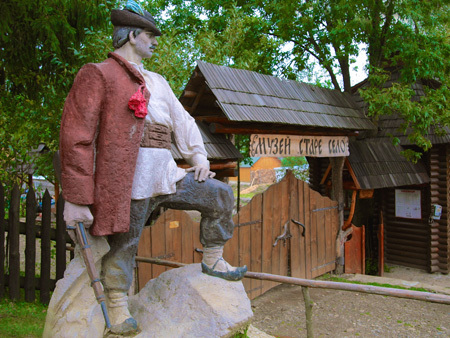 Kolochava combines culture of hutsuls, Boykies, Lemkies, Hungarians, Romanians, Germans, Jews, Czechs and Slovaks, as well as introduces a variety of exhibits, including national dress. At the Skansen territory attracts also display “Kolochavska narrow gauge”, the main object of which is the engine. The route is interesting for its history, beginning in World War II. Tourist route lies at an altitude of 800 to 920 meters above sea level. The route is 1.5 km. 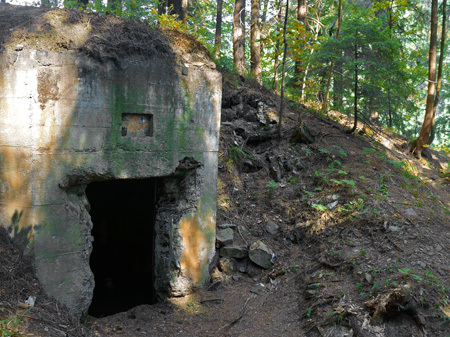 The route is interesting for its fortifications, which number 39, two walk-coupling length of 500 m, and machine and machine-gun points. 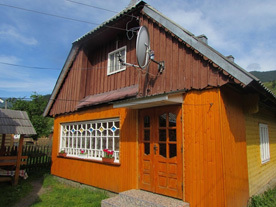 Motel “Ostriky” is located at the offices of the national park “Synevyr” and the main road of Hust - Synevyrske lake. 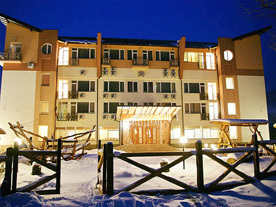 Recreation Complex “Agio” is located in the village Kolochava intermountain area with high level of service and all the conditions necessary for winter and summer holidays. Manor “Synevyrske Lake” is the quiet place for an inexpensive family vacation in the environmentally clean Carpathian Mountains. 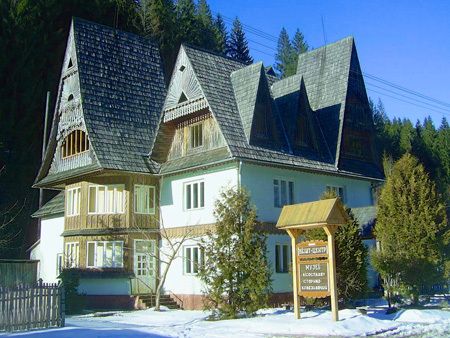 Recreation facility “Kamjanka” is located in the village Mizhhirya on the territory of the national park “Synevyr” with scenic views of the Carpathian Mountains. 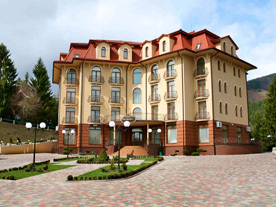 Grand Hotel “Pylypec” and restaurant complex is located on the outskirts of the mountainous village in Pylypec Mizhhirya area, which is known as a resort in the Carpathian Mountains with infrastructure for walking, cycling and mountain tourism. 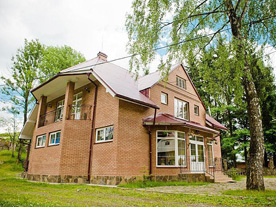 Hotel complex “Zhiva voda” offers a rest in the village Mizhhirya with a recovery by mineral water “Soimy” and a professional pool. Synevyr lake was formed as a result of a powerful shift caused by the earthquake, about ten thousand years ago. At an altitude of 989 m, rocky mountain rocks rose towards rapid stream, forming a dam and completely blocked the narrow valley. Giant gorge that emerged at the same time was filled with water of three mountain streams. In a transparent and crystal clear water of the lake today feel great, rare species of fish like trout, rainbow and brook trout. At the bottom of the lake Synevyr there is a hole that serves as a natural regulator of water and thus the lake is not out of the banks, even during major floods. People with their creative imagination try to complement the beauty of nature. One of Ukrainian architects very well inscribed viewing platforms surrounding landscape. At peninsula rises carved from mahogany sculpture “Syn and Vir”. This sculpture rests on the bottom of the metal base. The height of the monument is 13 meters. The Ukrainian horror film “Synevyr” by Alexander and Vyacheslav Aloshechkin was shooting in the park. In ancient times, this land belonged to a wealthy count, and people had to work for him, grazing sheep and cows, chopped wood. The wife of Earl died after giving birth to him and has left an only daughter, who was his only consolation. Mother called her Syn because the girl was born with light blue eyes that seemed bluer from the sky. Sin grew up and became a beautiful and count was proud of his daughter above all. Once the count ordered to carry himself in the mountains - would see if loggers work well. A daughter asked to go with him. While engaged in the affairs of the graph, Syn went up the mountain to gather flowers. Suddenly she heard sounds of floyar looked back and saw the guy - he played so well. It was a Vyr- shepherd. Sin approached him, and Vyr was struck by her beauty. She spoke to him, and when she was going back, they agreed to meet here tomorrow - because loved each other, as they say, at first sight. A week passed, two, Syn and Vyr has not imagined life without each other, when suddenly father Earl learned about their meetings. His indignation knew no bounds, and he forbade her daughter to meet with shepherds and disgrace their family. However Syn failed to temper father get her to do something against his will was impossible. Then count ordered to kill Vyr. The count's servant waylaid the shepherd and dropped it on a stone block with rocks. Learning of this, Syn ran to the place of death of a loved one, clasped his hands and wept stone, and many tears shed wretched, that in the place there was a lake. The lake water is clean as a tear, and blue, as blue eyes, and in the middle is seen the tip of the boulders that killed her lover. And people called lake Synevyr. Therefore, people called the lake “Synevyr”. Environmental education – is one of the priorities of Natural Park “Synevir”, which aims meaningful impact on the attitudes, behaviors, and activities of the population towards environmental awareness and involvement of local people to preserve the natural heritage. Park ”Synevyr” provides diversified activities towards public awareness. Special attention is paid to work with young people. On the base of Visitor Centre of national park “Synevyr” seminars on environmental ethics for students of all schools in the region are held. Traditional in Park “Synevyr” became the actions “Christmas tree”, “Snowdrop”, “Clean River” and those that are dedicated to specific ecological dates: “International Day of Wetlands”, “World Day of forests”, “World Water Day”, “The day of meetings birds”, “Environment Day”, “Earth Day”, “International Day of climate”, “World Environment Day”, “Day of the natural reserves”, “World animal day”, and so on. Park “Synevyr” takes part in various festivals: “Seeing the mountain”, “On Synevyr trembity call”, “Carpathians meet”, where are presented the exhibitions about nature conservation agency. The regional ecological and educational newspaper “Blue Vyr” is published.